Warren Nesbitt, a seven-year-old boy. The realistic relationship (and dialogue) between siblings. Dragon, a 122-year-old dragon who is real and only visible to Warren. Dragon, the stuffed animal everyone thinks is what Warren is always referring to! Warren’s twin sister, Ellie and her quick wit and snide comments. Friendly next-door neighbors, Nia and Paula Berry, are a gay African-American couple with three children. Michael Berry, first-grader and soon-to-be Warren’s good friend. Alison Cohen, Warren’s classmate in Mrs. Tierney’s class. The descriptions of lunchtime in Book 1. The Nesbitt family need to move because Mom, an engineer, has been offered a job in a new city. All of Alison Cohen’s pets in Book 2 and a burgeoning friendship. Warren’s fear of Dragon eating Chewy in Book 2. In Warren & Dragon: 100 Friends (Book 1), the Nesbitt family move to Eddington. 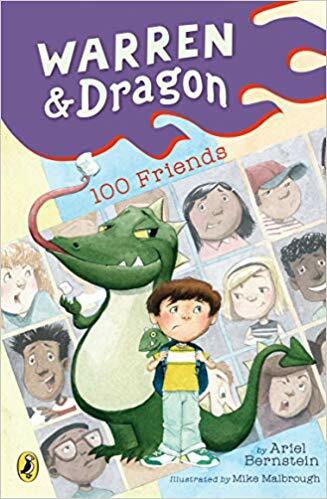 While his sister Ellie is not happy about having to leave all her friends, narrator Warren has his pal Dragon and doesn’t care much. After some goading from his sister, Warren decides to set a goal of making 100 new friends despite feeling uncomfortable doing it. However, there’s no way he’ll let Ellie get the better of him when she proclaims, “There’s no way you’re going to make more friends than me!” Luckily Dragon says he knows how to make friends as long as it involves massive amounts of marshmallows. When Warren’s first day of school isn’t going as well as he’d like, things go further south when Dragon goes missing. Soon he is recovered safe and sound, even content, helping Warren to realize that the experience has taught him how to make a new friend. 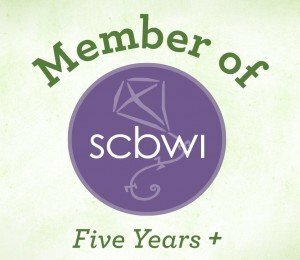 The book works on several levels, one being the friendship aspect and another being a “new school” story. The sibling, family, and neighbor dynamics also add to the pleasure of reading this first installment in what promises to be a popular series. Witty dialogue from all the main characters makes for fast flowing, always funny ten chapters in this very entertaining read. Initially I read it quickly, eager to find out how Warren fared in his new school. Then I read it more slowly a second time to see how Bernstein pulled me into her well-crafted tale. 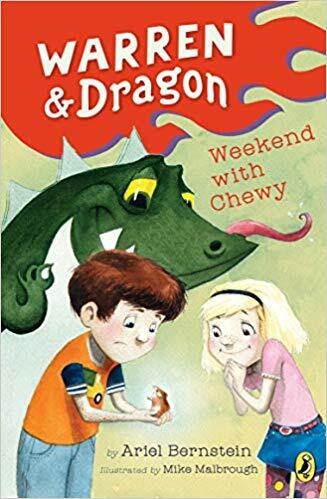 Kids are going to want to read every book in the series which is great for two reasons: 1) It’s engaging and relatable and 2) Book 2 is available and Book 3 in the series, Warren & Dragon: Scary Sleepover, comes out in 2019. Malbrough’s charming illustrations, dotted throughout both books, are a welcome addition for children just transitioning to chapter books. These two chapter books confirm that Bernstein knows what type of story will appeal to young readers. I’m looking forward to more of Warren and Dragon’s adventures because anything goes as long as there are marshmallows in the mix! 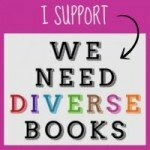 Find a review of a picture book by Ariel Bernstein here. My curiosity is always piqued by books that contain maps inside their front and rear covers. 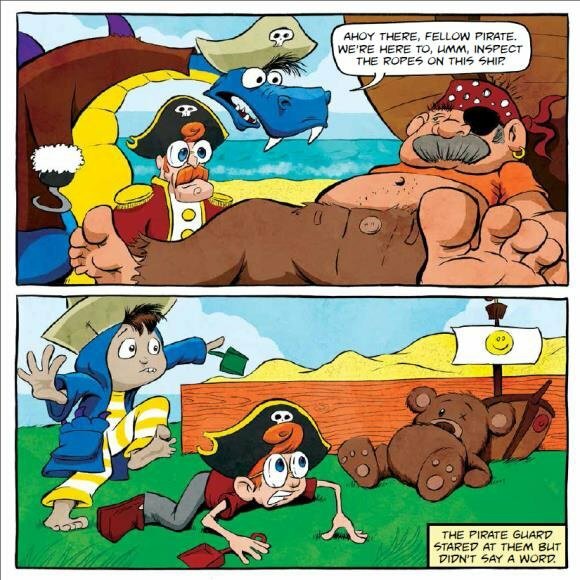 Happily, Dragon and Captain has got ’em! Here’s why. Maps play a crucial role in this story, presented in comic-style format. This original picture book features two main characters who happen to be next door neighbors. It’s also clear the boys are friends who’ve played a pretend game of Dragon and Captain countless times, if Dragon’s map is any indication. Dragon, a boy in a dragon robe, and Captain, a boy with a tri-cornered hat, have their work cut out for them the morning the story opens. Captain, it seems, has lost his ship! 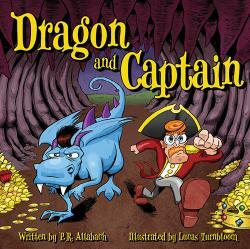 Together, Captain and Dragon must brave the unknown by going through a forest, down a cliff and ultimately to the sea in their quest to find the missing vessel. Armed with a compass, a telescope, the map, and massive amounts of imagination, Dragon and Captain set off on a creative adventure (in the backyard) as their moms chat nearby. Interior artwork from Dragon and Captain by P.R. Allabach with illustrations by Lucas Turnbloom, Flashlight Press ©2015. 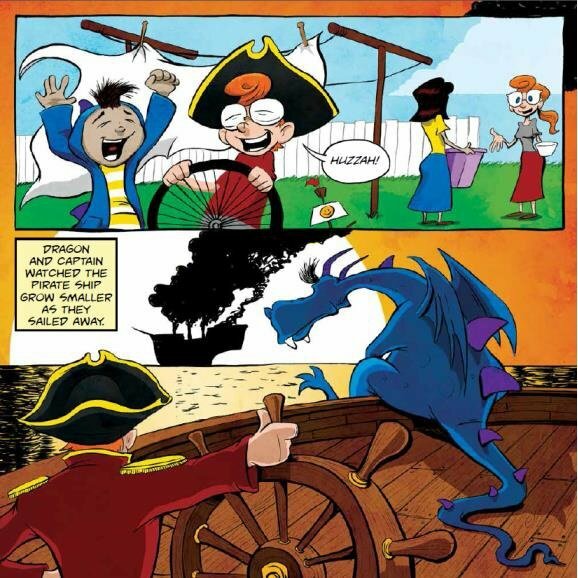 Dragon and Captain must foil a bunch of pirates’ plan to commandeer Captain’s ship. Can the duo stop this dastardly deed and get home in time for lunch? Well this reviewer won’t say, but you can probably guess the answer by the expressions on the boys’ faces in the illustrations below! Between Allabach’s pleasing prose and Turnbloom’s terrific artwork, the team of Dragon and Captain and their active imaginations come to life in this thoroughly enjoyable role playing romp. Picture books like this one should certainly spark children’s interest in inventing their own games of make believe. Get an activity guide for the book here. Find the Dragon and Captain Facebook page here. 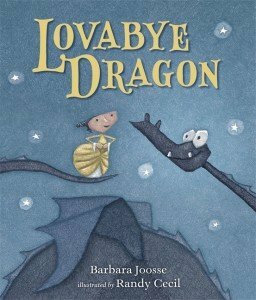 In Lovabye Dragon by Barbara Joosse, it seems not all little girls are waiting for their prince to come, says reviewer MaryAnne Locher. 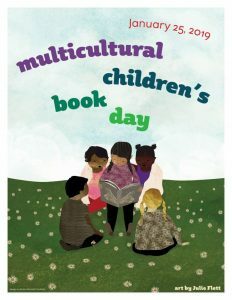 Lovabye Dragon by Barbara Joosse with illustrations by Randy Cecil, © 2012 Candlewick Press. 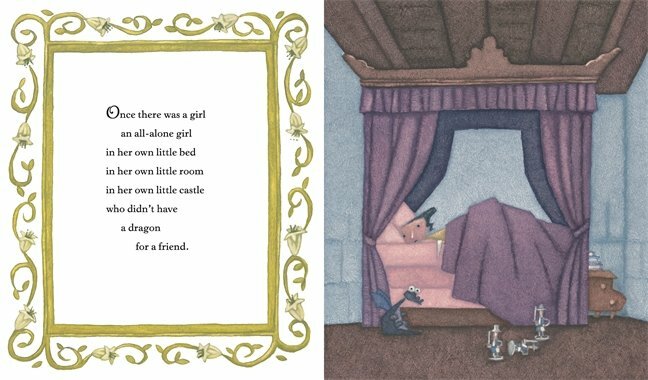 The princess in the castle in the picture book, Lovabye Dragon, written by Barbara Joosse with illustrations by Randy Cecil (Candlewick Press $15.99, Ages 3-8) dreams of having a dragon for a friend. Cecil’s choice of soothing blue, purple, and green oil paint colors and brush-stroke technique are the perfect match for Joosse’s book, reminiscent of Mem Fox’s lyrical prose and poetry blend. Silver tears of loneliness make their way through the castle, across the moat, around the glen and at last reach a bug-eyed sleeping dragon in his cave who has been dreaming of a girl for a friend. The dragon follows the trail of tears, back around the glen, across the moat, and through the castle to at last find his girl. An unlikely, forever friendship ensues as the dragon chases away the monsters and giants from the little girl’s life and she in turn sings him beautiful lullabies to help him sleep. They know that although they are very different on the outside, they are “exactly the same size in the middle” where it counts. It is refreshing to find a book with an atypical princess (she’s not your usual beauty) flying off on an unusual dragon (he’s protective, not scary). Now I can’t wait to read this perfect little book to two perfect little girls in my life. Interior spread from Lovabye Dragon by Barbara Joosse with illustrations by Randy Cecil, © 2012 Candlewick Press. NOTE: Though not a new picture book to review (this one’s from 2012), Lovabye Dragon was one that stood out as an exception.